The Nobel Prize in Physics 2014 has been awarded to Isamu Akasaki of Meijo University and Nagoya University, Hiroshi Amano of Nagoya University and Shuji Nakamura of the University of California in Santa Barbara “for the invention of efficient blue light-emitting diodes leading to bright and energy-saving white light sources”. Although the highly prestigious prize in Physics this year is being awarded for something that is more of an invention than a discovery, it is definitely in the spirit of Alfred Nobel since it has been given to those who “have conferred the greatest benefit on mankind”. Blue light-emitting diodes (LEDs) are the cornerstone of white LED lamps. They enable considerable energy savings due to their high power efficiency compared to incandescent light bulbs. Furthermore, LEDs contribute to an improved quality of life by providing solar-powered lighting to people far from electricity grids, which means, say, that children can do their homework in the evening and small businesses can stay open after dark. White light can be created by combining red, green and blue light, as was demonstrated as far back as 1672 by Sir Isaac Newton. A white LED lamp can thus be created by combining one red, one green and one blue LED. However, most white LED lamps today are based on the more cost-effective solution of using only blue LEDs covered with a phosphor coating to convert part of the blue light into green and red through luminescence. White LEDs of this kind currently exceed 300 lm/W, while they achieve at the same time an electric-to-light-power efficiency of more than 50%. This can be compared to the incandescent light bulb which produces 16 lm/W and has a power efficiency of about 4%, and also with the fluorescent tube which yields 70 lm/W. Therefore, replacing incandescent light bulbs with the white LEDs which are 10 times more efficient can mean considerable energy savings, particularly in industrial economies where 20-30% of electricity consumption goes on lighting. Moreover, the LEDs have a very long lifetime of 100,000 hours, which is 100 times longer than the hitherto common incandescent light bulbs and 10 times longer than fluorescent tubes. In addition, the LEDs contain none of the toxic mercury unfortunately present in fluorescent tubes. Due to their high efficiency and compact size, blue LEDs are now a part of our daily lives, forming standard components in devices such as full-colour displays, flashlights in mobile phones, car headlights and light sources for general illumination and decorative lighting. Industry and academia had been able to envisage many of those applications before blue LEDs became a reality, and considerable investment was therefore put into the field, but despite all the efforts made the creation of blue light proved a drawn-out struggle until the Nobel Laureates finally succeeded where everyone else had failed or given up. Why was it so challenging to create blue LEDs, and what did Professors Akasaki, Amano and Nakamura do to overcome these hurdles? LED emissions in the visible spectrum (red) were demonstrated in October 1962 by Holonyak and Bevacqua at General Electric. The researchers had used a gallium arsenide phosphide (GaAsP) compound to fabricate pn-junctions as shown in the figure above. The devices were introduced on the market in record time by General Electric. Red LEDs were commercially available as early as December in that same year, and cost US$ 260 per item. Today, a red LED costs less than US$ 0.20. Due to its inherent material properties, light emission from GaAsP LEDs is limited to colours ranging from infrared to yellow. Green, blue, violet and ultraviolet light cannot be produced by combining the components in this way. The commercial success of the red LEDs spurred intense efforts in research which lasted almost 30 years and sought to fill in the gap in the colour spectrum. The research during this period was, with very few exceptions, exclusively focused on II-VI compound semiconductors such as zinc selenide. These semiconductors were seemingly ideal for this purpose. They have the same crystal structure (zinc blende) as the relatively cheap and high-quality gallium arsenide substrates. The lattice constants (specific atom-to-atom-distance in the crystal) were also very similar, which meant that II-VI crystals with very low defect concentrations could be synthesized on gallium arsenide substrates. Both lasers and LEDs based on these materials were demonstrated in the laboratory but did not result in any commercial products due to their very limited lifetimes. It was discovered that despite the advantages, the II-VI materials were extremely sensitive to defects which were created and multiplied as a result of the current passing through it when connected to a power source. The defects rapidly degraded the device performance until it completely failed within minutes or hours. The only blue LEDs that were commercially available during this period were based on silicon carbide. The properties of this latter material (indirect band gap) made it highly unsuitable for light emission applications. Consequently, the devices employing it were of extremely low efficiency and brightness. They were commercialized despite these severe shortcomings for the simple reason that no alternatives existed. 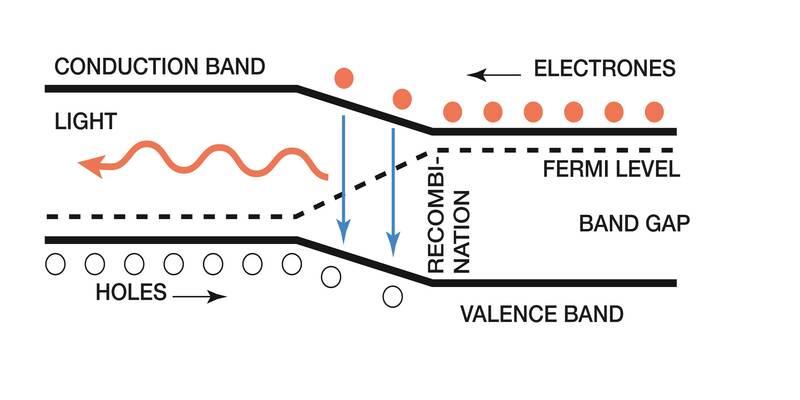 The energy diagram shows how the electrons in the n-doped material occupy the upper level (conduction band) and the holes in the p-doped material occupy the lower level (valence band). When a p- and n-type semiconductor are joined together, electrons flow from the n-doped material towards the p-doped material leaving behind fixed ionized positive charges, and holes flow from the p-doped material leaving behind fixed ionized negative charges. This results in a built-in electrical field that eventually prevents further flow of carriers across the junction. When an external electric field is applied by, say, connecting the LED to a battery with the anode on the p-side and the cathode on the n-side (i.e. forward biased), the thermal equilibrium is disturbed and the overall field across the junction lowered. Electrons from the n-doped material and holes from the p-doped material are then injected towards the junction where they can recombine and emit their excess energy in the form of photons. Another material considered for blue light emission was gallium nitride (GaN). As early as 1971, blue, green, yellow and red emissions from a special type of GaN consisting of a metal insulator semiconductor diode were demonstrated by Pankove et al. at the RCA Princeton Laboratories. This type of device worked without p-doping which was as yet unachievable, but its efficiency was too low for practical application. The material produced by Maruska and Tietjen, also at the RCA Laboratories, exhibited a very high and uncontrollable n-type background doping. For these reasons and because of the very poor quality of the GaN crystal layers (there was no suitable substrate), GaN received very little attention during the 1970s and 1980s. It was seen as a useless material. 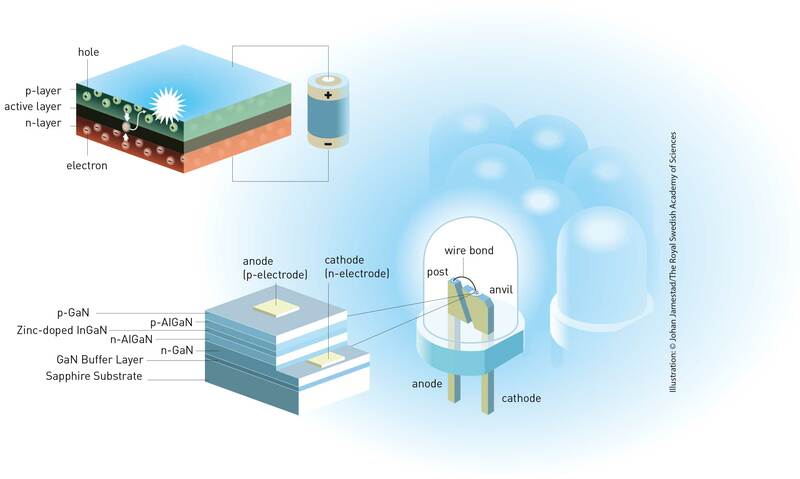 However, the groundbreaking work of Isamu Akasaki and Hiroshi Amano at Nagoya University removed the major roadblocks concerning GaN and restored it as a potential candidate for blue LEDs. In 1986, Amano and his coworkers showed that high-quality GaN crystal layers could be obtained using a special technique involving crystal “buffer” layers. During 1988, Akasaki and his coworkers presented p-type doped GaN layers using for the first time magnesium as the p-dopant material. Surprisingly, even after these key discoveries, GaN was still not considered as a serious candidate for blue LEDs. Shuji Nakamura changed all this. At the time, he was an employee of Nichia Chemicals (Japan), a small company specializing in phosphors and other chemicals. The company chairman and founder, Nobuo Ogawa, gave Nakamura the task of exploring GaN further. Ogawa realized that the market value for blue LEDs was sky high, and he therefore decided to make a killing by investing in GaN. The results were quick to follow. In 1991, Nakamura fabricated his first pn-junction that emitted blue light, and in 1993 he developed the first efficient blue GaN LED with a high light intensity. Nichia introduced the device on the market the same year. The first GaN-based blue-violet laser diode was developed in 1996 by Nakamura, who also improved the lifetime of both LEDs and laser diodes by developing a special crystal growth method. The devices were a resounding commercial success and the range of applications for blue LEDs has been constantly extended. The basic principle behind an LED. It consists of an electron-rich region (n-type semiconductor) and an electron-deficient region (p-type semiconductor). The different types can be produced through doping, a process in which some of the crystal atoms (typically 1 out of 100,000) are replaced by atoms of a different element. If the replacement atom has more (less) electrons than the substituted crystal atom, an excess (deficiency) of electrons is created, yielding a so called n-doped (p-doped) material. Why did the Nobel Laureates succeed where everybody else had failed? The problems surrounding the choice of blue GaN-based LEDs were massive. There were no suitable substrates on which to grow the GaN-based semiconductor material, which meant that crystal growth had to take place on a different material, such as sapphire. This resulted in increasing mechanical strain on the GaN material layer, which in turn generated a considerable number of defects (one defect being, for example, a missing atom in the crystal). A material with a high defect density will result in a poorly performing device, since high defect density will tend to have a detrimental effect on both electrical and optical properties of the material in question. By comparison, silicon, which is employed in the vast majority of microelectronic components fabricated, has a defect density of <100/cm2, and GaAs, a material used in many optoelectronic devices, has a corresponding density of 100-5000/cm2, while the defect density in GaN is in the order of 100.000.000/cm2. GaN was therefore considered useless as a material for efficient light emitters. Amazingly, however, it turned out that despite its high defect density, GaN can prove most efficient: it is the type of defect that matters, not simply the density as such. Another major hurdle was the p-doping. Since most optoelectronic devices are based upon a junction between p and n-doped materials, no such devices could be produced without p-doping. These two obstacles (achieving high crystal quality as well as p-doping) were the main reasons why virtually all researchers throughout the world had given up on GaN, with the notable exceptions of Professors Akasaki, Amano and Nakamura. They showed strong motivation and commitment, worked with great determination, and managed to obtain funding for their work despite all the scientific challenges. One proof of their success was the investment made by Nichia in Nakamura to the tune of USD 3.3 million, the equivalent of 1.5% of its annual sales. This amounted to remarkable risk-taking for a small company on a single blue-sky research project with a completely unknown outcome which nobody else believed in. Nevertheless, this is proof once again that it is often essential to take risks in research in order to achieve significant breakthroughs and commercial profit. When asked why Nichia had placed so much trust in Nakamura, Nichia’s chairman Ogawa simple answer was that: “Nakamura fell in love with GaN”. Today, 23 years after the first demonstration of the first pn-junction GaN-based LED, the research on GaN-based light-emitters is a broad area of research attracting many researchers in both academia and industry. It is an area which still requires a lot of basic material research, yet is at the same time sufficiently developed to allow for device research. At present, considerable effort is being put into expanding compounds which we will be able to grow based on group III elements combined with nitrogen (III-N), such as high quality InxGa1-xN with a higher concentration of indium (In), that can reach further inside the green wavelength regime and grow pure InN. Growth will take place on non-standard crystal planes (so called non-polar and semi-polar planes) to explore the potential effect on the optical and electrical properties. In order to overcome some of the problems associated with the high resistivity of p-doped material, much of the work has been focused on the tunnel junction of late, and breakthrough results were achieved last year when it proved possible to create tunnel junction resistivities close to tunnel junctions which were GaAs-based, despite the high band gaps and low doping concentrations of GaN-based materials. In terms of devices, considerable research is still being done to understand and improve the power efficiency of LEDs, since this is an area of huge commercial interest. There is also discussion about switching to laser-based illumination sources in order to increase efficiency at higher drive currents and to lower the cost. For example, during the autumn of 2014, both Audi and BMW are launching laser-based headlights in some of their new car models. New types of devices are also being produced with the help of III-nitride-based materials, such as the first example of room temperature operation that uses a polariton laser (“thresholdless laser”), which was published a couple of months ago. In a very short period of time, GaN-based light-emitters have made a significant contribution to mankind, and they are definitely here to stay. New III-N-based materials and devices are being constantly explored and developed, and novel applications will follow. Here at the Photonics Lab at the Chalmers University of Technology, we are combining materials with device research and are focusing on light emitters such as Ultraviolet LEDs and blue-emitting Vertical-Cavity Surface-Emitting Lasers. We are very much looking forward to continuing our work in a field that has just started to take off. 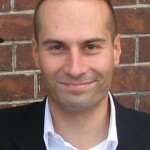 The research being done by Tommy Ive is focused on advanced crystal synthetization techniques, including molecular beam epitaxy and metalorganic vapour phase epitaxy for the fabrication of novel structures and materials based on GaN and related semiconductor compounds. 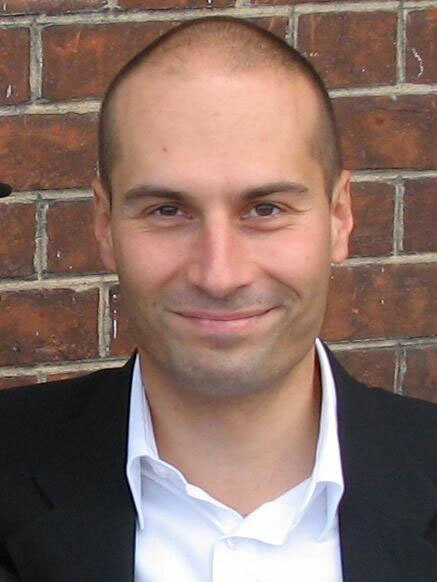 His recent projects have included ultraviolet GaN LEDs, indium nitride for transistors and blue Vertical-Cavity Surface-Emitting lasers (together with Åsa Haglund). He has also worked on non-polar GaN-based blue LEDs in Shuji Nakamura’s laboratory at the University of California, Santa Barbara. 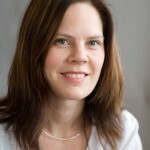 Åsa Haglund’s research is mostly focused on III-nitride based microcavity lasers including Vertical-Cavity Surface-Emitting Lasers (VCSELs), but she is also involved in projects on ultraviolet GaN-based LEDs, GaAs-based VCSELs for datacom applications, heterogeneous integration of GaAs-based VCSELs on a Si platform, and graphene optoelectronics. 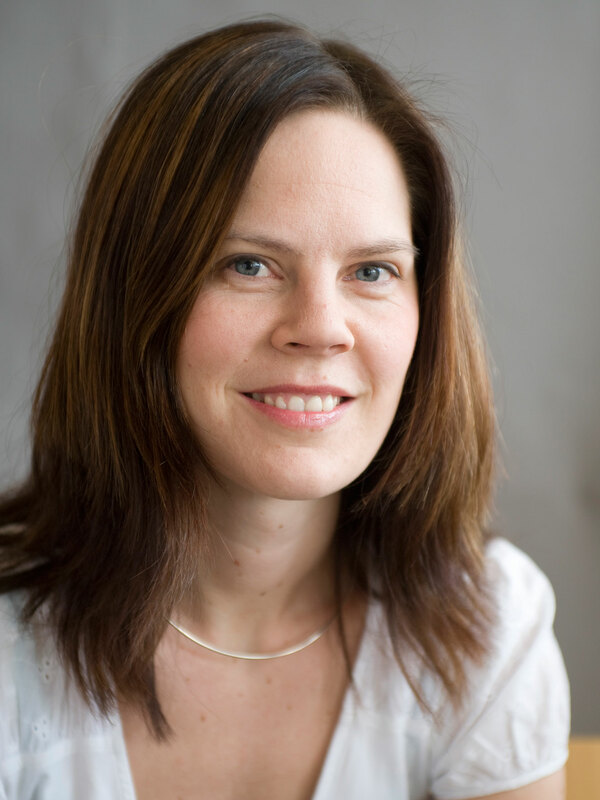 She has previously worked on III-nitride-based deep ultra violet LEDs, mode and polarization control in VCSELs by shallow surface structures, widely tunable VCSELs using electrothermally actuated mirrors, GaInNAs ridge lasers and spectrally engineered edge-emitting InGaAs lasers.